Oh, baby! Time to up your grill game with this Jamaican Jerk Style Chicken with Black Bean and Mango Salsa! Boneless skinless chicken breasts are a mainstay of warm-weather grilling. They’re virtually fat-free, are pure protein and if you compare the price per pound with some other proteins, they’re still fairly affordable. However, if not cooked properly, this part of the chicken can be dry and rather ho-hum. It’s important to start with a good product. At the very least, use minimally processed, all natural, hormone and antibiotic-free chicken. If your budget allows, organic, free-range chicken is even better. I grew up on a farm where we raised our own chickens, so I’m adamant about the quality of chicken we consume at home and that I use for my clients. Chicken is cooked through and safe to consume when an instant-read thermometer reads 165 degrees inserted into the thickest part. If cooked to a higher temperature, you run the risk it will be dry. A good, accurate meat thermometer is important for food safety and allows you to properly enjoy what you spent hard-earned money on and took the time to prepare. 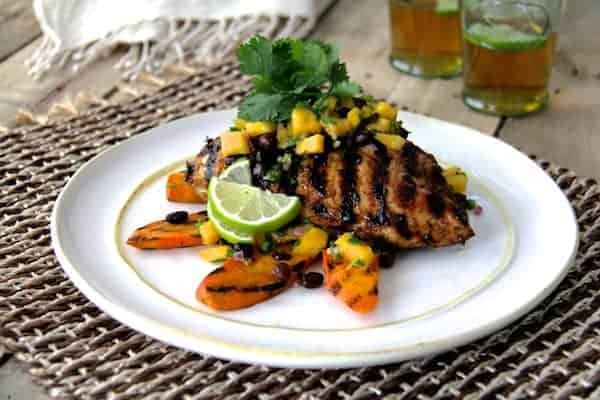 This lively marinated and grilled Jamaican Jerk Style Chicken with Black Bean and Mango Salsa is anything but ho-hum. Jerk is a style of cooking native to Jamaica that uses a dry spice mixture or wet marinade that is extremely spicy. Feel free to use the hottest pepper you can handle in the marinade and salsa. Scotch bonnet or habanero peppers are generally used. My husband can tolerate those; a jalapeño or Serrano is hot enough for me. A jerk seasoning blend contains spices such as allspice, cloves, cinnamon, nutmeg, thyme, dried chilies, sugar and salt. The salt-free jerk blend for chicken and fish that is available at Penzeys has great flavor and is what I like to use. The recipe for black bean and mango salsa makes plenty to accompany the chicken. If any salsa is left over, enjoy it for lunch the next day served over tender lettuce. Simply grilled sweet potato planks are the perfect side dish! Want another amazing Caribbean-style dish? Try my Mojo Pork Skewers and Pepper Jelly Glazed Sweet Potatoes! Time to up your grill game with this Jamaican Jerk Style Chicken with Black Bean and Mango Salsa! If any salsa is left over, enjoy it for lunch the next day served over tender lettuce. Grilled sweet potato planks are the perfect side dish! Combine all ingredients except chicken in a mini food processor and process until smooth. Transfer marinade to a zipper-top plastic bag. Place chicken in the bag. Remove as much air as possible and seal. Gently squeeze the bag to thoroughly coat the chicken with the marinade. Refrigerate 8 hours or overnight. Preheat grill to medium-high heat. Remove chicken from bag and discard marinade. Place chicken on grill then reduce heat to medium and cook 8 to 9 minutes per side or until cooked through to 165 degrees. Combine all ingredients in a bowl. Serve with chicken. This is just perfect for tomorrows dinner! Beautiful photo!